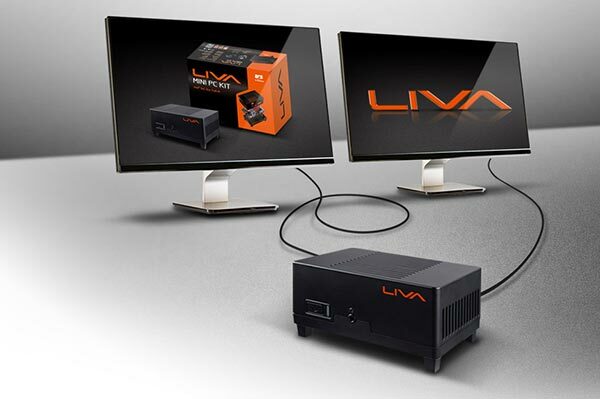 ECS has launched LIVA, a windows based mini-PC kit. It claims this is the world's smallest Windows-based mini-PC kit and proudly claims that it offers "all the features of much larger PCs," and is suitable for "modern digital living, general computing, casual gaming and basic applications". This compact PC kit is really a full system that you self-assemble and all that is required is an OS. It is small enough to hold in the palm of your hand at 118 x 70 x 56 mm. It's also very light at 190g, that's the same weight as the Lenovo S860 smartphone, or just 5g heavier than the more widely known Nokia Lumia 920. For your OS to complete the 'kit' you only have Hobson's choice, according to the ECS website, Windows 8.1 (64bit) is it. Ubuntu support is said to be "subject to updated versions". ECS suggests that a LIVA mini-PC is a good choice as a secondary PC, like a media centre as it is silent and powerful enough for streaming, browsing and downloading. With great portability and an HDMI output you should be able to take this system anywhere with ease. It's probably best paired with one of those wireless keyboards with a built in track pad. The guys over at TechPowerUp got their hands on an ECS LIVA mini-PC sample last month and showed readers how the kit is easily assembled, and gave the system a few tests and general workout. They found that the LIVA offered 'decent' performance, low power consumption and silent performance in a small light package. The only drawbacks were the meagre USB inputs, limited expandability and no Mic input (though the official spec currently lists an audio combo jack as being installed). The ECS LIVA is expected to retail at under $200. Looks like a decent bit of kit. A little of subject, I know, but, for the love of god, can they stop using that stupid music in ads and promos for electronics. I'm not sure what genre it is, but it's been milked more than the COD franchise. * Scream. It appears they are using only the dual core version of Bay Trail M - would have been nice of they could have gone for the quad core version! One thing i noticed is the power connector appears to be micro-USB.